The Rappan Athuk Adventure Maps series presents miniatures-scale map tiles for the world’s most perilous dungeon – Rappan Athuk, the Dungeon of Graves. Like the PCs in your campaign, this series hopes to cover the most exciting encounter areas throughout Rappan Athuk. Perhaps it will succeed or perhaps the 33 levels will prove to be too much. 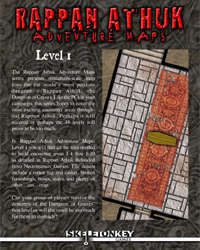 In Rappan Athuk Adventure Maps: Level 1 you will find all the tiles needed to build encounter areas 1-4 thru 1-10 as detailed in Rappan Athuk Reloaded from Necromancer Games. Tile details include a rotten rug and casket, broken furnishings, bones, stairs, and plenty of other... um... crap. Can your group of players survive the denizens of the Dungeon of Graves’ first level or will the smell be too much for them to stomach? 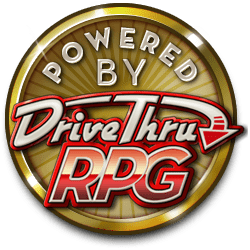 Want to expand or customize your dungeon? Many of the tiles in this product are compatible with e-Adventure Tiles Cave and/or Dungeon sets. This title was added to our catalog on October 11, 2006.